It had been known that the PETM roughly coincided with the formation of massive 'flood basalts' – large stretches of ocean floor coated in lava, resulting from of a series of huge eruptions. These occurred as Greenland first started separating from north-western Europe, thereby creating the North Atlantic Ocean, the vestiges of which are still continuing in miniature in Iceland today. What has been missing is evidence linking these huge volcanic outpourings to the carbon release and warming that marks the PETM. Dr Marcus Gutjahr, who led the study while a post-doctoral fellow at the University of Southampton, and is now at the GEOMAR Helmholtz Centre for Ocean Research in Kiel Germany, explained: "In order to identify the source of carbon we first generated a new record of the change in ocean pH (a measure of its acidity) through the PETM, by measuring changes in the balance of isotopes of the element boron in ancient marine fossils called foraminifera." Professor Andy Ridgwell from University of California, Riverside continued "Ocean pH tells us about the amount of carbon absorbed by ancient seawater, but we can get even more information by also considering changes in the isotopes of carbon, as these provide an indication of its source. When we force a numerical global climate model to take into account both sets of changes, the results point to the large-scale volcanism associated with the opening of the North Atlantic as the primary driver of the PETM." 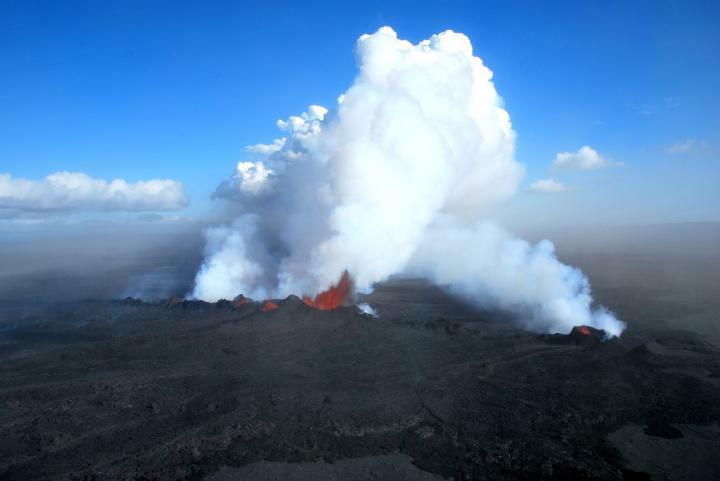 The team found that the PETM was associated with a total input of more than 10,000 petagrams of carbon from a predominantly volcanic source. This is a vast amount of carbon – some 30 times larger than all the fossil fuels burned to date and equivalent to all current conventional and unconventional fossil fuel reserves. In their computer model simulations, it resulted in the concentration of atmospheric CO2 increasing from 800 parts per million to above 2000 ppm. The Earth's mantle contains more than enough carbon to explain this dramatic rise and it would have been released as magma, pouring from volcanic rifts at the Earth's surface. Professor Gavin Foster from the University of Southampton said: "How the ancient Earth system responded to this carbon injection at the PETM can tell us a great deal about how it might respond in the future to man-made climate change. For instance, we found that Earth's warming at the PETM was about what we would expect given the CO2 emitted and what we know about the sensitivity of the climate system based on Intergovernmental Panel on Climate Change (IPCC) reports. However, compared with today's human-made carbon emissions, the rate of carbon addition during the PETM was much slower, by about a factor of 20." Dr Philip Sexton from the Open University in Milton Keynes continues: "We found that carbon cycle feedbacks, like methane release from gas hydrates which were once the favoured explanation of the PETM, did not play a major role in driving the event. On the other hand, one unexpected result of our study was that enhanced organic matter burial was important in ultimately drawing down the released carbon out of the atmosphere and ocean and thereby accelerating the recovery of the Earth system. This shows the real value of studying these ancient warming events as they provide really valuable insights into how Earth behaves when its climate system and carbon cycle are dramatically perturbed." 1)	The paper Very large release of mostly volcanic carbon during the Paleocene-Eocene Thermal Maximum is published in the journal Nature. Journalists can request a copy from Media Relations. 2)	Images are available from Media Relations. 3)	This collaborative study, also involving the University of Bristol, Cardiff University, University of Bremen, University of California San Diego and Yale University, is an output from 'Abrupt Ocean Acidification Events' jointly funded by the Natural Environment Research Council (NERC), Department for Environment Food and Rural Affairs (DEFRA), and Department of Energy and Climate Change (DECC) as part of the UK ocean acidification research programme. 6)	The Open University (OU) is the largest academic institution in the UK and a world leader in flexible distance learning. Since it began in 1969, the OU has taught more than 1.8 million students and has almost 170,000 current students, including more than 15,000 overseas. In the latest assessment exercise for university research (Research Excellence Framework, 2014), nearly three quarters (72%) of The Open University's research was assessed as 4 or 3 star – the highest ratings available – and awarded to research that is world-leading or internationally excellent. The Open University is unique among UK universities having both an access mission and demonstrating research excellence.